When the early followers of the Messenger of Allah, peace and blessings be upon him, were being persecuted, mocked, and even tortured by their own kinsfolk, Allah made a way for them to migrate to the city of Yathrib. Prophet Muhammad, peace be upon him, met with a delegation of twelve believers from the city now known as Al-Madinah, at Mount Aqabah on the outskirts of Makkah who offered him a pledge of allegiance. They assured the Prophet that they would protect the new Muslims in the same way they would protect their own wives and children, and that should anyone raise arms against them, they would certainly be prepared to fight. After this pledge took place, the Prophet permitted his followers, the Muhajireen or emigrants, to escape to Madinah, and when almost all of the Muslims had gone, then he himself, peace be upon him, migrated. The Muhajireen were the first converts to Islam, and due to their belief in the Prophet, peace be upon him, they suffered a great deal, sometimes at the hands of their own family members. Thus, after the Hijrah, the Prophet established ties of brotherhood between them and the Muslims in Madinah who came to be known as the Ansar, or the “helpers.” The Ansar provided shelter, hospitality, and protection, even offering to share half of their wealth and possessions with their new brothers and sisters in faith. Allah mentions their generosity in the Qur’an: “Those who believed, and adopted exile, and fought for the Faith with their property and their persons, in the cause of Allah, as well as those who gave asylum and aid, these are friends and protectors, one of another” (Al-Anfal 8:72). A comparison can be made of the Muhajireen of that era with the new converts of today in that they, too, embarked on a journey of faith and many have faced hardship and criticism from their own families for their decision. Conversion is a testing time, when new Muslims are struggling to learn and implement the basic principles of their faith, while attempting to explain their actions to parents, friends, coworkers, and classmates, and Shaytaan is busy trying to turn them back on their heels. During this transition, new Muslims need help from their “Ansar,” those who have been born and raised in the deen and have practiced Islam from an early age, as well as from those converts who have been practicing for years or even decades. These choice “helpers” have a responsibility to embrace their new brothers and sisters, provide warmth and hospitality to them, educate them, and shelter them from any harm that they receive from those who oppose and abuse them, as the Ansar of Madinah did for the Muhajireen of Makkah, earning them a high status with Allah, subhanahu wa ta’ala. Often, the only time new Muslims receive a kindly embrace is when they proclaim the Shahadah, but then they are left to struggle alone, when they do not even know how to make wudhu or pray, or the basic tenets of Islam, much less how to read the Qur’an. Many are left to celebrate alone during the Eid holidays, and some feel out of place when entering the masajid because they do not even encounter one smile from their brothers or sisters. 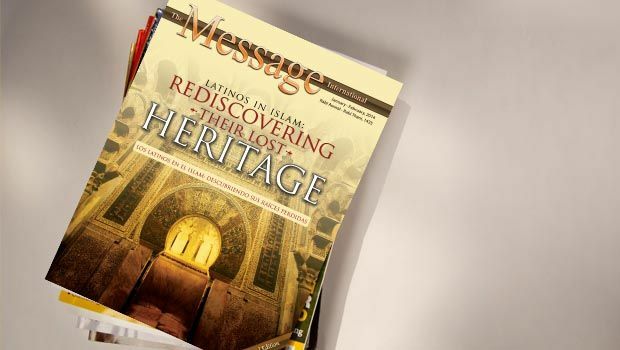 This edition of the Message International magazine highlights a “who’s who” in Spanish dawah, and features narratives from some of the Latinos who have embraced Islam. While reading these inspiring conversion stories, please remember all of our new brothers and sisters in faith. Next time you see a new convert, show your love and support, ask if they need assistance, invite them to your home, inquire about their families, and share your knowledge with them without expecting anything in return except earning Allah’s pleasure. It may be that if they learn any good through you, Allah will reward you each time they put it into practice. The Messenger of Allah, peace be upon him, said, “Whoever calls to guidance will have a reward similar to that of those who follow it, without the reward of either of them being lessened at all” (Saheeh Muslim: 2674). May Allah make our strength of character and our eman like that of the Muhajireen and the Ansar. May He fortify our bonds of brotherhood like those of the Muhajireen and the Ansar, and may He be pleased with us as He is pleased with them. Ameen.